I had to take a quick trip yesterday to Virginia Beach to see my friend Mark Finn. It was supposed to be hop on down, have a meeting, and jump back on a plane to NYC. Except that the plane was canceled and I had to spend the night and get up at 4 AM the next morning in order to catch the first flight and be on time for my meetings here. I expect to sleep well tonight. Mark was quite apologetic about the canceled flight, but I told him not to worry; this is not exactly the first flight that has been canceled on me. At least there was a nice hotel, and I was able to get booked on that flight out the next morning. Nowhere near the hassle of being canceled on in a foreign country, where you could be stuck for a day or more. Just one of life’s minor inconveniences. The joy of travel and all that. This was the main lesson that most emerging market policymakers learnt in 2008. Until then, having 100% of one's trade denominated in dollars did not seem awkward. But once the Lehman bust showed to the world that American bankers were no smarter than anyone else's and worse, that American regulators were also no better than any other countries’, then financing every trade and every investment in dollars rapidly shifted from being the “easy thing to do” to a “problem that needed to be addressed”. All of a sudden, it became obvious that depending on the dollar made no sense if the US banking system was badly managed and badly regulated. The scales fell from the eyes of the emerging markets' policymakers. And chief amongst the countries looking to make a shift was China which, by 2008, had become the number one, or at worst number two trading partner for almost any emerging market, importing commodities from Latin America, Afri ca, the Middle-East, Russia or South East Asia and exporting manufactured goods everywhere around the world. Indeed, in the face of weak Asian currencies, underwhelming Chinese economic data and disappointing global industrial and consumption numbers during 2013 (weak US ISM, weak EU retail sales, etc.) most would likely have expected Chinese bonds, or the renminbi, to fare poorly. We tend to favor the latter explanation, probably because, for China, successfully transforming the renminbi into a trading currency is more than just evolving towards settling its own imports in its own currency (as advantageous as that may be). Internationalizing the currency may well be the key to China’s future economic growth. Indeed, when thinking about China’s economic development, most of us intuitively think of all the “Made in China” goods stocking up the aisles of Walmart or Carrefour. And it is undeniably true that China’s prosperity has relied heavily on the export of cheap consumer goods to rich countries. China’s modern economy has mostly been export-led. This is unlikely to change overnight, even if ‘net trade’ has historically not been such a large contributor to GDP growth. Instead, exports have been central to China’s development model as the country’s insertion into the global supply chai n has forced constant productivity gains. This cycle of improvement has been driven by technology and management know-how transfers, along with rapid shifts in the labor force. Thus, it is hard to imagine a strongly growing future for China without growing exports. Which brings us to China’s current quandary: basically, over the past 30 years, China got rich by selling cotton underwear and plastic-soled shoes to the world. This is why most people carry an image of China as a phalanx of sweatshops, churning out T-shirts and toys for American and European shoppers. However, this image is now as outdated as skinny jeans. Instead, most of the growth in Chinese exports comes from industrial goods — and the customers are increasingly firms in developing countries building local infrastructure. China clearly no longer wants to pursue the high volume, highly polluting, low margin businesses which enabled it to rise from dire poverty. Instead, China (or at the very least, the Chinese Ministry of Commerce) now envisions its future as one of selling earth-moving equipment to Indonesia, telecom switches to India, cars to the Middle East, oil rigs to Russia and auto machinery to Eastern Europe or Latin America. The probl em, of course, is that once one starts to compete with the likes of Caterpillar, Siemens, or Komatsu, having low prices may not be enough. Instead, offering attractive financing terms may be the deal clincher. Greece's central bank has issued a last plaintive scream before the axe falls, as if delivering an Aeschylean curse. The plagues of the earth will descend upon the Greek people if the radical-Left Syriza government of Alexis Tsipras persists in defying Europe's creditor powers and opts for default. They will eat dirt for the rest of their lives. They will freeze in rags. They will moan and wail, forever. "Failure to reach an agreement would mark the beginning of a painful course that would lead initially to a Greek default and ultimately to the country's exit from the euro area and – most likely – from the European Union," it asserted. "A manageable debt crisis would snowball into an uncontrollable crisis, with great risks for the banking system and financial stability. The ensuing acute exchange rate crisis would send inflation soaring." The central bank did not present these as potential dangers in a worst case scenario - something we might all accept - it asserted that they would occur unless Mr Tsipras agrees to terms imposed by Brussels before the Greek treasury runs out of money. "All this would imply deep recession, a dramatic decline in income levels, an exponential rise in unemployment and a collapse of all that the Greek economy has achieved over the years of its EU, and especially its euro area, membership. From its position as a core member of Europe, Greece would see itself relegated to the rank of a poor country in the European South." Never before has such a "monetary policy" report been published by the central bank of a developed country, or indeed any country. It is a political assault on its own elected government. Zoe Konstantopoulou, the speaker of the Greek parliament, rejected the document as "unacceptable". Furious Syriza MPs called it an attempt to strike terror. Yannis Stournaras, the central bank's governor, is not a neutral figure. He was finance minister in the previous conservative government. His action tells us much about the institutional rot at the heart of the Greek state, and why a real revolution is in fact needed. Where does one begin with the clutter of wild assertions in his report? It is not true that Greece would "most likely" be forced out of the EU following a return to the drachma. Such an escalation is extremely unlikely, despite a chorus of empty threats along these lines by Brussels. The decision would be taken on political and geo-strategic grounds by the elected leaders of Germany, France, Britain, Italy, Poland, and their peers in the European Council, with Washington breathing down their necks. If they want to keep Greece in the EU, they will do so. European treaty law does not give categorical guidance on this issue. It is famously elastic in any case. The Swedes, Poles, and Czechs remain outside EMU, though "legally" supposed to join. The issue is finessed in perpetuity by a vague promise to join when the time is right. The same can be done for Greece, with a flick of the fingers. There may be some in the EMU power structure who wish to make life hell for Syriza in order to show that no country can buck the EU power structure and get away with it, or to scotch their own rebel movements, above all Spain's far-Left Podemos. Bitter recriminations will certainly fly if Greece defaults on $340bn to EMU governments and institutions, inflicting direct losses on the peoples of Lithuania, Latvia, Slovakia, Slovenia, and Portugal - all in varying degrees of trouble themselves. This is the moral choice that Syriza has to make. It is the poisonous legacy of the EU-IMF Troika bail-out in May 2010, when EMU leaders roped in their own taxpayers to bail out German and French banks and save the euro. The transaction was disguised as a loan to the Greek state, by then bankrupt. This fatal decision - amplified by a second botched bail-out in 2012 - transformed a conflict between Greece and north European banks into a fratricidal conflict between the EMU nations themselves. So yes, it is possible to imagine the worst. Yet if Europe was to act on this punitive impulse, it would compound the disaster. As Mr Tsipras warned two weeks ago, the creditors risk setting off a process that may "entirely transform the economic and political balances throughout the West." Interpret that as you want. It sounded to some like a warning that Greece would shift into Russia's orbit if pushed too far. The south-Eastern flank of the Nato military alliance would unravel, just at the moment when Vladimir Putin is redrawing borders by force and shattering the post-War order of Europe. It may also be the moment when Nato must invoke its Article V solidarity clause in the Baltics to defend the very states pushing for the harshest treatment of Greece. Do the Baltic finance ministers and defence ministers actually talk to each other about their Greek NATO ally? "If some think or want to believe that this decision concerns only Greece, they are making a grave mistake. I would suggest that they re-read Hemingway’s masterpiece, “For Whom the Bell Tolls”," he said. Throwing Greece to the wolves altogether would inflict incalculable damage on the European Project, its solidarity creed exposed as humbug. "Nobody would have any more faith in Europe if we break apart in the first big crisis," said Germany's vice-Chancellor, Sigmar Gabriel. Such folly could happen, but I doubt it as long as Chancellor Angela Merkel remains the leader of Germany and pre-eminent statesman of Europe. It is a fair bet that she would go to great lengths to keep Greece in the EU family, inside the euro or out, knowing just how enormous the stakes really are. As for the mechanical claims of the Greek central bank, they are fatuous. Grexit might "send inflation soaring", might lead to an "exponential rise in unemployment", and might lead to a "collapse of the Greek economy", (as if the latter two had not occurred already), but there is no necessary reason why any of this should happen. The claim that all Greece's gains since joining the EU in 1981 - whatever they may be, measured against the counter-factual - is so preposterous that one can only laugh. The fall-out from Grexit would depend entirely upon the policies pursued by Syriza, the European Central Bank, the EU powers, the US, and the IMF, after the event. If it were a "velvet divorce" along the lines advocated behind closed doors by German finance minister Wolfgang Schauble, the outcome might be benign. Under such a plan the ECB would stabilise the drachma at an equilibrium level, perhaps 20pc below the current real effective exchange rate (REER). There would be a 'Marshall Plan' to refloat the economy and reverse the collapse in investment. A study by Panteion University in Athens concluded that even if the drachma devalued by 50pc it would not in itself trigger an inflation spiral. Trade competitiveness would recover quickly. Claims of runaway inflation are invariably made by defenders of the status quo when fixed exchange systems break down. It was the mantra of 1931 before Britain left the Gold Standard, and again in 1992 before leaving the Exchange Rate Mechanism. It was eyewash on both occasions. Gabriel Sterne at Oxford Economics says capital flight from Greece has reached 60pc of GDP. Much of this is sitting in foreign accounts, waiting to return once the devaluation risk is out of the way. "The first few months would be chaotic but the money would come back. Greece is probably economically better off outside the euro, so long as it pursues sensible policies," he said. What is clear is that current state of affairs is intolerable. Mr Tsipras lashed out at the creditors this week for "pillaging" his country, and accused the IMF of "criminal responsibility". This was a step too far, but he was right to protest that the current demands on Greece are the worst of all worlds. "We find ourselves in a situation where the IMF prevails when it comes to strictness of austerity, but the EU prevails on the refusal to accept debt restructuring," he said. This is the nub of the matter. It is IMF austerity without the IMF cure. There may be many powerful reasons why Greece should stay in the euro - I neither advocate for, or against - but these have nothing to do with economics. They are political, almost spiritual. They hang on an existential debate about the country's proper home: is it fully part of the West or should be looking to its Eastern, Orthodox, "Byzantine" roots, as so many of its greatest artists suggest. The relevant question is whether can Greece pursue its own course within the euro, or whether tragic events have shown that it should retreat to drachma for the sake of its sovereign soul. A symbolic court victory for AIG shareholders perhaps is the beginning of government’s retreat to more normal boundaries. Anybody who bothered to be alive and paying attention knows what happened with AIG AIG -0.19 % in 2008. 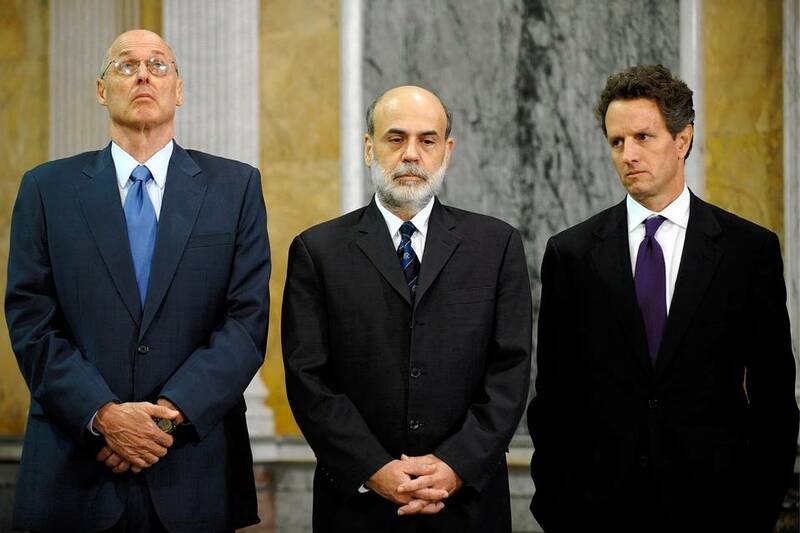 Trying to guess what the political system both demanded and would tolerate from them, Henry Paulson, Ben Bernanke and Tim Geithner had made the decision to let Lehman go belly up—only to discover the markets panicking and the global economy quaking. “Americans are not for nationalization,” Chuck Schumer went on TV to aver. Nancy Pelosi yielded to Mr. Paulson on bended knee. And with these two potential grandstanders brought into compliance with the agenda of saving the financial system, one good legacy of the Great Depression was borne out: Washington does not stand around while the banking system collapses. AIG-Lehman was the pivotal moment, marking the transition from the politicians-as-headless-chickens phase of the crisis, to the “we’re all in this together” phase—meaning Democrats and Republicans, liberals and conservatives, who uniformly concluded they wouldn’t have political careers if they failed to act. The bailout was foremostly the act of a political class saving itself, and incidentally, the rest of us if you believe the narrative that says we were a few days from a massive destruction of jobs and wealth. But neither did we get off scot-free. It’s been a long way back. There was a political price to be paid, and we’ve paid it—with Obama priorities that put expanding entitlements and regulation above restoring dynamism and growth to the economy. The same was experienced in the Great Depression. The “bold, persistent experimentation” of FDR was less concerned with reviving growth than with left-wing social planners taking advantage of a capitalist class flat on its back to impose their own agenda. One act of long-delayed healing was this week’s AIG decision. Symbolic maybe, but the ruling serves to underline once more the primacy of the rule of law in American life, however much it may have been mussed up and dirtied in the exigencies of the moment in 2008, and then in the opportunism of the Obama forces in its aftermath. Judge Thomas C. Wheeler of the United States Court of Federal Claims only stated what we all understood at the time: Officials were loath to let AIG fail for the effect it would have on banks and Wall Street firms, but equally loath to receive the brickbats they would receive if they just flat-out guaranteed AIG liabilities (as they would do for just about every institution shortly). Messrs. Bernanke and Geithner needed to be seen taking a pound of flesh, and they did so by imposing harsh loan terms and confiscating 79.9% of AIG’s stock ownership. But they faced a problem. AIG is governed by bylaws. Its shareholders have rights. If allowed to vote, they might have rejected the deal, preferring to try their luck in bankruptcy. Bankruptcy’s job, after all, is to preserve value for claimants, and, in retrospect, the government having stopped the free fall of the financial system, plenty of value likely would have been left even for AIG’s shareholders. But this was also a Catch-22, since the government had settled on AIG as its instrument to begin the rescue of the financial system. In fact, AIG shareholders might have had Washington over a barrel. Recall that Bear Stearns’s Fed-midwifed sale to J.P. Morgan JPM -0.34 % a few months earlier had to be rejiggered at the last minute to make it acceptable to Bear’s shareholders. Messrs. Geithner and Bernanke were not keen to repeat this embarrassment, and so extorted from AIG directors a bailout surrender that deprived shareholders of their legal rights and expectations. Judge Wheeler, in finding fault with this outcome, dealt neatly with the Catch-22, essentially ruling that a court couldn’t assume anything would have been left for shareholders in the event the government’s larger rescue campaign had failed. He awarded no damages but at least established clearly that in using AIG to save the financial system, the government had broken the law with respect to its treatment of AIG shareholders. By the way, don’t believe the guff you’ve been reading about how future rescues now will be imperiled. Dodd-Frank may remain problematic, but Judge Wheeler’s ruling only means the Fed will find it harder to force bailout recipients to accept terms inferior to terms they believe are available elsewhere simply for the purpose of scoring political points off shareholders. A little, "it would be funny if it wasn't so depressing" feeling has been languishing for years, and how it is being covered has only elevated it to farcical levels. Alternating bouts of platitudes, threats, and a journalistic requirement to speak with authority and certainty when neither exist, have made the Greece problem a red herring. Greece does have a problem. A very serious national one. However, the real problem is in the EU, and there are no answers to how to “solve it” because the root of the problem is not being addressed. First off, let's just assume that a deal is struck. It really shouldn't be hard to imagine, since in reality Greece and the IMF have been sparring over relatively small numbers. Unemployment is over 26%. Plus, new data shows that, in 2014, the number of the unemployed who could not find work in over a year jumped to 73.5%, up from 67.1% in 2013. Greece also has one of the highest percentages of elderly people at around 19.5%, along with a shrinking population as more people emigrate than immigrate, and more people die than are born. If a deal were to be struck, what would change in that equation? Absolutely nothing. For some reason, perhaps a perception issue or a bias towards easier to digest metrics, we forget that economies are first and foremost a creation of the mass behavior of people. The simple reality is that fewer and fewer Greeks must shoulder the costs of an aging population that is not working, a pension system that eats up 75% of all spending other than interest payments on debt. This trend will continue unabated for decades. If Greece doesn't find a deal even more favorable to it than what is being rejected by the EU and IMF, then it would essentially be taking a usurious loan from a mob-connected boss. The cost will always be greater than the benefit, and there is no climbing out for at least an entire generation. The interest rates might not seem terribly high, nor are they in comparison, but when combined with the sheer amount due and previous cuts, it becomes more than Greece — specifically the current government — can afford. As much as the EU and IMF would rather work with more compliant negotiators when they control the coin purse and Greece has its hat in hand, Europe needs to ponder who will visit Brussels next if the current Greek government doesn't succeed. The current Greek government is a compromise between the far left Syriza and populist right Anel parties, united by the anti-austerity cause. Pension cuts are a third rail for both parties, and defiance of pension cuts demand is a linchpin of the coalition. The parties in power will suffer a grievous blow if they return with a deal that includes these cuts, or if they return with nothing. The survival of the coalition is dependent on this issue, and for the parties to retain power they may be forced to choose a Pyrrhic political victory over a Pyrrhic economic victory that leaves the country better off, but puts bureaucrats in the riot-torn streets. History is filled with such decisions, and they rarely end with an altruistic swan song by politicians. If a deal is forced through at the cost of Greek politics, or if no accommodation is made by the EU and IMF, it will only embolden other radical parties across the continent. It would create a “damned if you do, damned if you don't” policy by ascending radical parties. Euroscepticism — as it is increasingly called — is on the rise, increasingly in the periphery nations and core nations like England and Austria alike. Yet the EU is torn between camps, and it can either attempt to force the issue on Greece or powerful nations like Germany. Either it emboldens nations to leave the EU and defy the promise of a centralized Europe they were sold, or it allows a small nation, both in population and economic clout, to control the terms of a deal. In this sense, the whole EU dilemma is akin to a darker version of a scene in The Princess Bride. Both sides are in a stand-off, about to drink from two cups, one of which contains a deadly dose of iocane powder. The thing is, both cups have poison in them, and you don't know which one has built up enough of a tolerance survive. In fact, the odds are pretty good that neither side is prepared, economically or politically. The economic realities of high unemployment, aging people, and crippling debt don't belong to Greece alone. Nor are the politics that create new governments that are completely intolerant of the status quo or continued austerity demanded in Brussels by other nations. Greece is facing a nightmare, but the markets aren't worried about missed payments, a couple billion in Euros or a 1% GDP cut. This is ultimately all about the fate of the EU experiment itself. The EU has made it this far mostly because everything went in its favor for nearly 15 years of bull markets, massive inflows, and strong economic growth. Those days are gone, along with the stable support people in EU member nations have for the union. What happens in Greece, even if it is solved and everyone walks home happy somehow, will not be the last time we see fissures in the EU. In fact, it is only one of the first in a long line that will become an ever-present, long-term existential crisis.